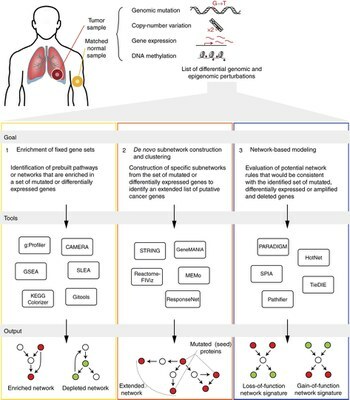 You are here: Home / Publications / Linding Lab, BRIC & DTU [2011-present] / Pathway and network analysis of cancer genomes. Creixell P, Reimand J, Haider S, Wu G, Shibata T, Vazquez M, Mustonen V, Gonzalez-Perez A, Pearson J, Sander C, Raphael BJ, Marks DS, Ouellette BF, Valencia A, Bader GD, Boutros PC, Stuart JM, Linding R, Lopez-Bigas N, Stein LD. Genomic information on tumors from 50 cancer types cataloged by the International Cancer Genome Consortium (ICGC) shows that only a few well-studied driver genes are frequently mutated, in contrast to many infrequently mutated genes that may also contribute to tumor biology. Hence there has been large interest in developing pathway and network analysis methods that group genes and illuminate the processes involved. We provide an overview of these analysis techniques and show where they guide mechanistic and translational investigations.